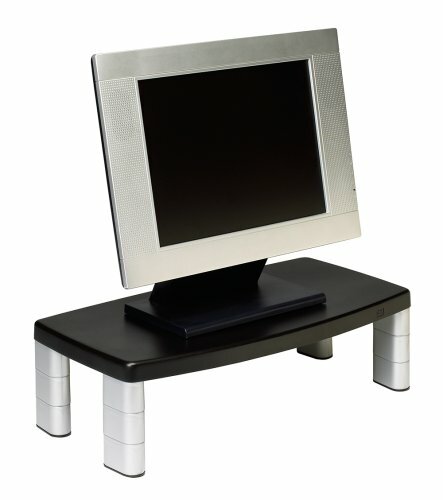 3M Adjustable Height Monitor Stand MS90B, 20.0 inches x 12.0 inches x 5.875 inches, Black. Great for Laptops, Printers or Monitors up to 17 inches or 40 lbs. Non-skid base. The monitor stand was purchased to act as a cover for a surge protector/battery backup and its maze of wires connected to it. It works very well to protect those things from dust, and makes for a much neater appearance on my desk. Assembling the leg parts and connecting them to the platform takes a bit of patience as the components are upside down as one works on them and don't always stay in place.